Happy Monday all! Today I have the pleasure of hosting an exclusive excerpt from Never Tear Us Apart by Monica Murphy! This is the first book in a new series and will be releasing on January 5th. I close my eyes for a brief moment and swallow hard. All the memories come at me, one after another, blazing over me like wildfire, and I grip the edge of the counter. The memories are unwanted. I’d banished them from my mind, fought those demons long ago and won. They represent an old part of my life, another part I try my best to forget even happened. Yet just like that, seeing her, hearing her, I’m the old me again, cracked so wide open it makes my heart hurt. “Seemingly harmless?” Lisa asks in that no-nonsense tone of hers that makes the hair on the back of my neck stand on end. I’ve had that voice directed at me more than once. When I was a kid and scared out of my mind and I didn’t know what to say. Katie. When I see her like that, it all comes rushing back at me, memory upon memory, word after word, promise after promise. My legs feel weak and I grip the edge of the top. You can’t be scared, Katie. You have to be brave. You have to come with me. What if he finds us? What will he do? He won’t do anything to you. I won’t let him. Lisa’s back on the screen, her eyes narrowed, head tilted like she’s concentrating hard. Like she cares. Snorting out loud, I shake my head. She cares all right. I can’t believe Katherine is talking to her. It’s been so long since I referenced her like that it sounds foreign. But she was mine. For a tiny bit of time I took care of her, was responsible for her safety. She called me her guardian angel and though I denied it, deep down inside, it felt good, her calling me that. Thinking of me in a good way. A positive way. Without hesitation I did what was right. I had to. I couldn’t let him keep her. He would’ve . . . I can’t even imagine what he would have done to her. Not only was I her guardian angel, she called me her hero. 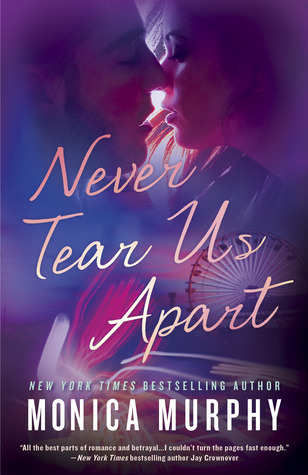 Monica has a giveaway going on to win a signed copy of Never Tear Us Apart on Goodreads which you can find and enter here. Thanks to Monica for letting us host this excerpt! This entry was posted in Book News, Excerpt, Exclusive, Favorite Authors, Giveaways, Monica Murphy, New Adult, Romance, Upcoming Release and tagged Book news, Excerpt, Exclusive, favorite authors, Giveaways, Monica Murphy, New Adult, Romance, Upcoming Release.